I saw several reports on Facebook from my relatives and friends in Laos about feeling “the shaking of the earth” at their homes earlier today. These reports came after all days of posting about Christchurch Earthquake. There were pouring sympathies to the people of Christchurch and then talks on whether or not Laos is prepared for such a natural disaster. Apparently, they felt the earth shaking for a few seconds and were checking the news for an official report. I searched on Google for some news and found The earthquake was measured at magnitude 4.6 by the U.S. Geological Survey. I hope there is little damage or no damage from the earthquake and no one was injured from the incident. Vientiane Times – Earthquake rumbles through northern Laos: An earthquake measuring 4.7 on the Richter scale occurred at about 11pm on Wednesday in Xayaboury province, according to the Lao Meteorology and Hydrology Department. An earthquake of 4.7 magnitude of 4.7 that hit northern Laos on Wednesday night caused no damage to hydro-dams in Thailand, an Electricity Generating Authority of Thailand official said on Thursday. 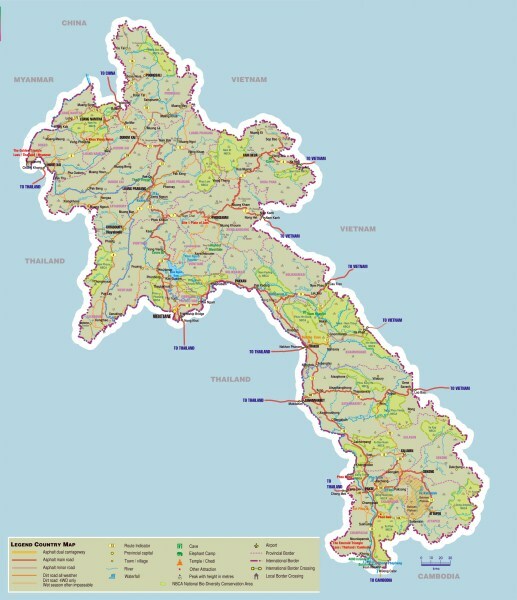 A 4.7-magnitude earthquake hit the Lao Peoples’ Democratic Republic late Wednesday, causing underground movements which could be felt in many provinces of Thailand and cracking the walls of the structure housing revered Phrathat Chae Haeng in Thailand’s northern province of Nan. 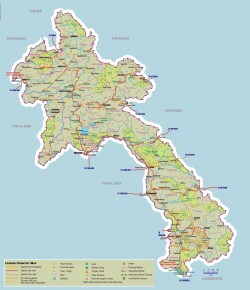 The epicenter of the earthquake was in Sayaboury province of Laos, about 55 kilometers from Nan’s Mae Rim district. In Vientiane, the capital of Laos located approximately 150 km from the epicenter of the earthquake, there was no damage and, as far as i know, no one was injured from the incident. I do not know about the situation in Xayaburi province. As for myself, I was lying on the floor reading at the time and had the impression that there was a very loud noise which I mistook for a distant explosion and was in fact probably not audible as I realize now. It was shortly followed by a rather intense vibration of glass windows which distracted me from my reading. I then had the impression that the whole house was subjected to a slow swinging which made me wonder if I was really awake or dreaming. It’s only when I talked to my wife who was in bed at the time and who reported a similar experience to me that I realized what happened and got confirmation of the earthquake by checking the internet. In Loei ,Thailand far from Zayaburi about 180 kilometers. It surprized me so much. I haven’t touched like this before.I thought that the earthquake was far from me but it is not I had known that the earthquake in Lao was about 5.4 . Oh! It frighten me ,Thanks god ! no one hurt. Aeo.